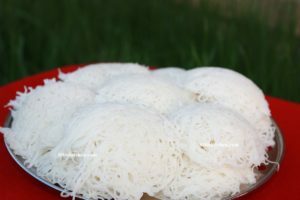 Idiyappam or String hoppers is a culinary specialty in Tamilnadu, Kerala and Coastal areas of Karnataka. It is also popular in certain areas of Sri Lanka. 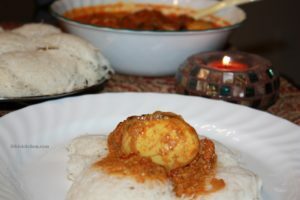 course at breakfast or dinner together with a curry (potato, egg, fish or meat curry) and coconut chutney. It is also served with sweetened coconut milk in Malabar region of Kerala. 1.Boil water by adding salt. Then add the boiled water to the rice flour little by little and mix it well using the back side of a spatula till it become a soft and smooth dough. 2.Then grease the idli moulds with little oil and then take a small amount of dough and put it in the Idiyappam maker and press it into the Idili moulds in a circular fashion.Sprinkle little grated coconut on top of the idiyappam. 3.And then keep the Idili moulds in a Idili cooker and steam for around 10 minutes.